After you have created a ticket, you can go back at any time and edit a ticket. You can also reopen a ticket that has been closed. To the right of the line the ticket is on, click the Edit icon. The system displays the Edit Ticket pane. 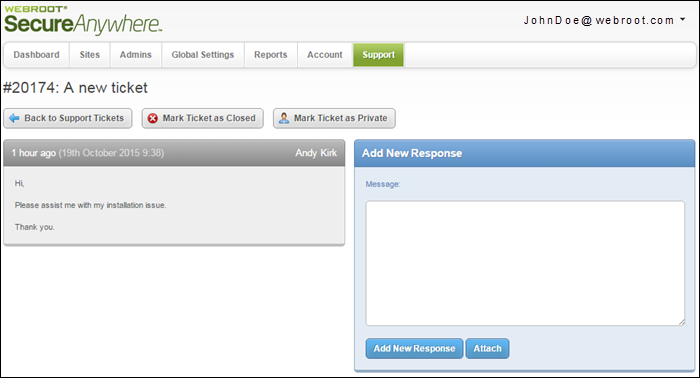 Return to the Support System pane... Click the Back to Support Tickets button. Click the Mark Ticket as Closed button. The system moves the ticket to the Closed Tickets pane. To open a closed ticket, click the Edit icon for that ticket. Make the ticket public or private... Click the Mark Ticket as Private / Mark Ticket as Public button; the button acts as a toggle between the two settings. Enter any new information in Message field... Click the Add New Response button, and enter information into the Message field. Select an image or log file to attache to the ticket.